"And if you plan so much that you can't function without one, life's no fun. All the calendars, journals, and lists in the world won't save you when the sky falls." Okay, so I should preface this review with two statements. (1) I'm a huge fan of nature and camping and (2) I've always wanted to go on a backpacking trip in California. Therefore, the entire premise of this novel immediately appealed to me. 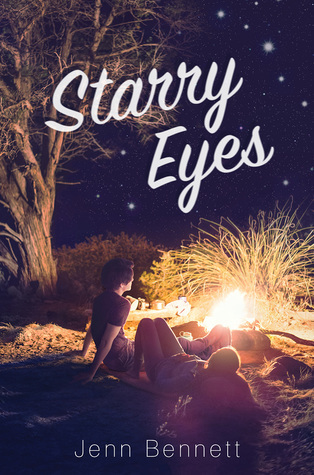 Throw in some steamy makeout sessions in tents, life-or-death situations, and plenty of emotional drama and you've got yourself a young adult novel worth reading. The plot is fairly simple on the surface: Zorie isn't the outdoorsy type, but she gets roped into a glamping trip with a crew of popular kids, who then turn out to be not-so-great (shocker). Then, she's forced to toughen up and trek through the High Sierras with a guy named Lennon with whom she shares a complicated history. The story is 100 percent entertaining and will definitely have you squealing at the sheer adorableness a least a handful of times. Bennett doesn't just stick to the adventure genre; she delves into topics like parenting, adultery, suicide, self-confidence, and plenty of other B-I-G topics. Oh, and then there's the whole relationship between Lennon and Zorie, which is a really wonderful romance. I gobbled it all up like a roasted marshmallow on a stick. I'm not going to lie: I mostly loved this one because of the romance and the camping. Zorie + Lennon are goals, and the story is just so enjoyable. I was a huge fan of Alex, Approximately so I think it's safe to say that Jenn Bennett's got talent. Definitely pick this one up if you're in the mood for a bit of a hot, emotional trip complete with treacherous hikes and wild animals. Starry Eyes won't disappoint fans of adventure and the outdoors.